IAH will be taking part in World Water Day activities on 22 March and beyond. Once again, our Early Career Hydrogeologists’ Network have produced a poignant video. 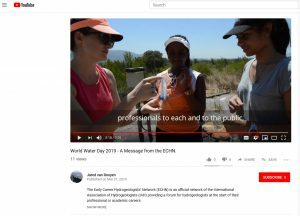 We are hugely grateful to them for taking the time and effort to make it, and strongly encourage you to take a moment to watch and share it… we are incredibly proud that such wonderful people from ECHN are the future of responsible hydrogeology. Look out for posts on our social media sites and we’d also love to find out what you’re doing for World Water Day – tag @iahgroundwater on Facebook, Twitter and Instagram. 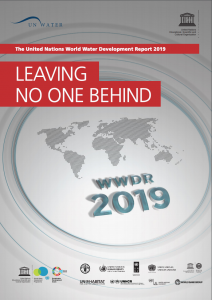 To coincide with World Water Day 2019, the United Nations World Water Development Report, ‘Leaving no one behind’ was launched on 19 March. Improvements in water resources management and access to water supply and sanitation services are essential to addressing various social and economic inequities, such that ‘no one is left behind’. Safe drinking water and sanitation are recognized as basic human rights, as they are indispensable to sustaining healthy livelihoods and fundamental in maintaining the dignity of all human beings. Groundwater plays a critical part in ensuring non-one is left behind. 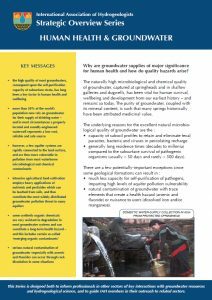 As our Strategic Overview Series paper on ‘Human Health and Groundwater’ says, ‘…the high quality of most groundwaters, consequent upon the self-purification capacity of subsurface strata, has long been a key factor in human health and wellbeing.’ Protecting good quality groundwater resources is vital for lives. Links to the ECHN video and resources are below. Thank you for supporting IAH – and be assured that for us, today and every day is World Water Day. What will you be doing?